1. Preheat oven to 350°. Grease a 9-inch springform pan; line bottom with parchment paper. Grease and flour parchment, tapping out excess flour; set aside. 2. Stir together chocolate and butter in a heavy saucepan over low heat until smooth. Remove from heat. 3. Beat egg yolks and 3/4 cup sugar in a large bowl at medium speed with an electric mixer until pale and thick. Add melted chocolate mixture, beating until blended. Add flour, beating until blended, stopping to scrape down sides. Stir in zest, chopped clementines, and orange liqueur. 4. Beat egg whites in a separate bowl at medium-high speed with an electric mixer until foamy. Add salt and remaining 1/4 cup sugar, 1 tablespoon at a time, beating until stiff peaks form. Fold one-third egg white mixture into chocolate mixture; repeat twice. Pour mixture into prepared pan. 5. Bake at 350° for 50 to 55 minutes or until slightly firm to touch. (Cracks will form on top of cake.) Remove cake to a wire rack; run sharp knife around edge of pan to loosen. Cool slightly. 6. Remove sides of springform pan. Invert cake onto serving plate, and remove springform bottom and parchment paper. 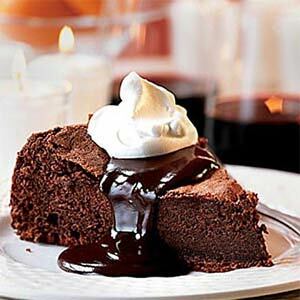 Serve warm with Hot Chocolate Sauce; garnish, if desired.